Exams are something that creates a lot of stress for students. If there were no exams things would have been so easy.But, then how do we decide whether we fit in a place? This means you cannot escape exams. Why do you consider it as a stressful event? Take it easy. It is just to ensure that you can compete with others, and yourself, as the years pass by.A simple mantra is – this will also pass through just like others and you will succeed. Once you are through it, you are one step ahead and wiser and smarter than you were the last time. We are all familiar to this phrase. Go to bed early and wake up in the early hours of the morning.Before the sun rises and before the birds set out of their nest, set your alarm! The general tendency of students is to snooze their alarm and go back to sleep and most of us doze off!This is the first thing you need to adhere to if you are really determined to crack your GATE exams 2019. Here are some tips for students self-studying for GATE 2019. There are no short cuts. You have to push yourself out of the bed and unless you take the initiative all that you will do is snoozing your alarm. This is just the beginning. Did you think you will crack Engineering? For most of the Engineering students, it was not a likely task to crack through their Engineering.But, now you are here. Wonderful! You have made it reach GATE and this means you have it in you.All these years, you have worked through tough and easy times to crack Engineering.When examination comes nearer we are all hungry for one thing and it is the only thing that is too less. The thing is “time”.So, this time, let us not fret the day before our examinations. Manage your time well. Plan your time according to the syllabus that needs to be covered. It is necessary that you eat healthy food and stay fit before your exams.You don’t want to fall sick a day before the exams and spoil the whole thing. It is necessary that you take care of your health. Follow a nutritious diet and include a lot of vegetables and fruits in your daily food that will help to boost your memory and brain power. A timetable and a checklist of the do’s will help you to find out whether you are on the right track.Once a particular topic is clear to you, check it and mark it done.You will find that you have completed your studies long before you need to.And you will get some time to relax and for a last minute revision before your GATE examination. 5. Do you have any doubts? This is not a new information. But, since our childhood days, we were told to clarify our doubts and not to wait until the day of the examination.Follow the same rule. While studying if you have any doubts, note it on a piece of paper.The next day when you go to your GATE Coaching Center in Calicut ask your tutor to help you. Never leave your doubts unclarified. Who knows whether they put the same question in the exam? No one wants to regret later during the exam time that you could have checked it long back. You know what are the topics that are too tough and the ones that you are quite easy with.The topics that you feel are too difficult needs constant brushing up and revision.Find time for this portion at least once in a day. You can dedicate less time to those sections that you can easily handle.Divide the easy and hard portions and then start studying allocating more time to the most important and toughest ones in the series. You might feel that you have covered all the portions tough and easy ones.Don’t be overconfident.You don’t want to be taking up an exam where the questions seem too strange to you.Later, you don’t want to pacify yourself thinking that the questions were too tough and you didn’t get enough practice to crack all those.So, try solving some previous year question papers or ask your tutor to put a mock test for you. Look at your score. It will give you an idea of where you stand and how much further improvisation you need. This is it. This is the day for which you have been preparing for an entire year now. So it is critical not to make any silly mistakes which will throw away all your hard work. Keep your cool; understand that you have gone through all the important GATE exam preparation books and you’re ready to face the exam. This attitude will help you to be confident and to recollect what you have studied effectively. Try not to cram up new GATE preparation material on the morning of the exam. It will be tempting to do so if your friends are doing it. But remember there is a high possibility of forgetting them as soon as you enter the hall because it will only get stored in your short term memory and besides, it can significantly disturb your level of concentration. Cutting the total time into different slots. Not to fret if you don’t get the answers in the first read. Proceed to the next questions and go back to it later. The chances are high for you to write the answer now. You have studied well, and there is nothing that you don’t know. You have passed your Engineering, so what is GATE? You will get through. Success is a part of the failure. So, don’t worry. If you couldn’t make it in your first chance, there is always the second one. Why not try it out again? Don’t worry, it is OK to fail. After all, these big people around us have gone through failures to achieve success. So, this is not the end of the world. There is always a second chance. This is the most important part of learning. Sometimes, we feel low when we are studying and all of a sudden it looks like we can’t do it.All the syllabus seems irrelevant, something that we cannot do. Do things that you like. Talk to your parents and teachers about what you feel.They will help you out with a better solution. Just remember the most simple thing “Rome wasn’t built in a day”. So, it takes some hard work, dedication and motivation from your part to get it done. How are your preparations for GATE exam 2019 going so far? What are the things that you do to keep yourself motivated? If you didn’t get any ideas, here are some top tips to pass gate 2019 with flying colours. Share your thoughts and feedback with us. 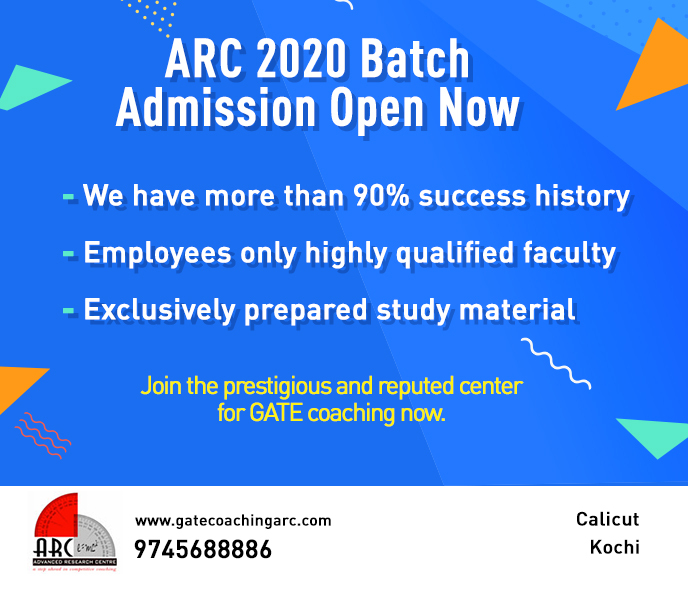 ARC foundation is one of the best GATE Coaching centers in Kerala. 1000’s of students who enroll in our coaching center have successfully cracked the GATE and are into some of the best colleges in our country. Are you planning to take up GATE 2019? Lack an idea of how the examination will be? Contact us today and we will help you out.